Saw three butterflies in the garden today, which seems impossible when there are almost no flowers blooming (for nectar) or foliage (for the little caterpillars). Thanks to the power of the almighty Internet, I have determined that they were Mourning Cloak Butterflies (Nymphalis antiopa antiopa). The other butterflies … belong to a large family known as "four-footed" or "brush-footed" butterflies because the two forelegs are too small for use in walking. 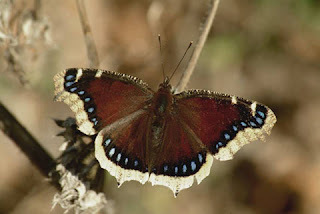 The Mourning Cloak Butterfly is the largest of our butterflies that hibernate as adults. On warm winter days it may be seen flitting through the leafless woods and it is the first to emerge in spring. The wings, the color of dead leaves underneath, are purplish-brown above with a broad yellow border and a row of blue spots just inside. The larvae feed, side by side in columns, on the leaves of willow, elm and poplar trees. I didn’t know they hibernated. I thought they sprung forth fully formed from the head of Zeus every spring.